Daniel Radcliffe has proven his talent as a stage actor with lead roles in Equus (West End and Broadway) and How to succeed in business without really trying (Broadway). Now he has returned to the West End stage playing the challenging part of Billy in The Cripple of Inishmaan, the third play in the Michael Grandage season at the Noel Coward Theatre. Billy is a young man with a handicapped arm and leg living on Inishmaan Island off the West Coast of Ireland. He lives with his two aunts and is subjected to cruel “jokes” from people in the neighbourhood. But the arrival of filmmakers sparkles hope for a better life in Billy. Daniel Radcliffe’s performance is what makes this play worth watching. He plays Billy with a raw intensity – a young man who is trying to stand up for himself against a wall of cruelty. Never once slipping our of character Daniel puts both emotional and physical effort into playing this challenging part. The play itself seems very stereotyped to me. All characters appear strangely overwritten. The aunts are just that tiny bit too strange, the village gossip is slightly too annoying, Helen appears a little too witty and cruel and her brother too one dimensionally stupid. And although it is clear that this play wants to show off the cruelty Billy has to face it simply goes to far for my liking. For example, I’m just not sure the constant use of the words “arse” and “feck” contribute anything to the overall message of the story. To me they just become old and annoying after a while. 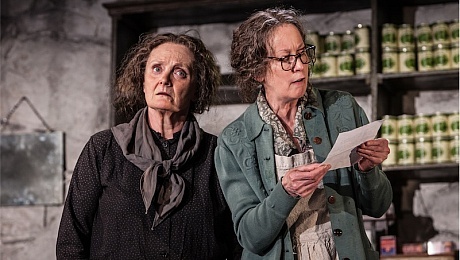 And I don’t know if it is done intentionally but the play doesn’t exactly sell Irish people favourably – apparently they are a bunch of alcoholic, violent and narrow-minded people. Obviously that’s not true but the play suggests just that. The Cripple of Inishmaan is sold as a dark comedy. I am a real fan of this genre but to me this play doesn’t exactly fit into this category unless you call constantly insulting a crippled boy dark comedy. Yes, there are moments that make me chuckle but a lot of the so-called jokes are just cruel (reflected in sometimes nervous / awkward laughter from the audience who doesn’t seem to know how to react to the things being said on stage). However, there are some outstanding moments in this play and especially the ending really got to me. This is mainly due to Daniel Radcliffe’s stage presence and his ability to draw the audience into Billy’s world. You just want that poor boy to have a better life, get what he wants and experience a little happiness. Without giving anything away, the last 10 minutes of the play are my personal highlight – just when he is about to give up we see a tiny bit of joy for Billy in the eyes of a hopeless future which is heartbreaking to watch. 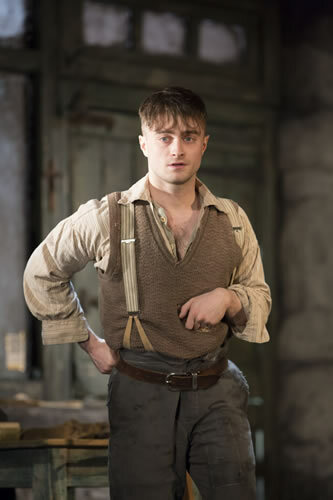 So while the Cripple of Inishmaan will never make it into my top 5 of favourite plays I do urge you to see this play – if only to experience a stellar performance by Daniel Radcliffe. Anyone who wasn’t convinced of his abilities as a stage actor should realise now that Daniel Radcliffe is definitely not “just” Harry Potter. 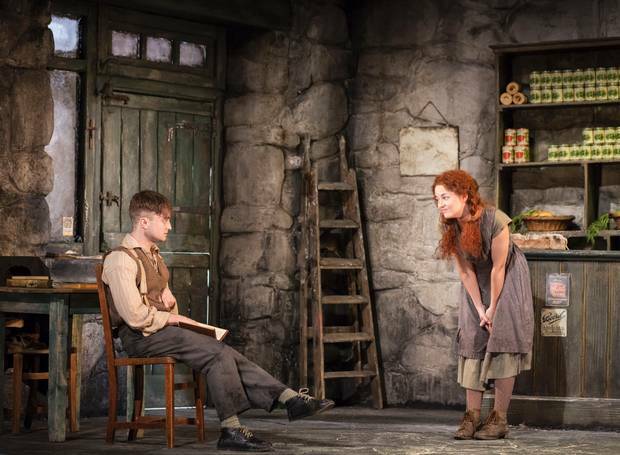 The Cripple of Inishmaan is playing at the Noel Coward Theatre until 31st August 2013. For more info and to book tickets go here.